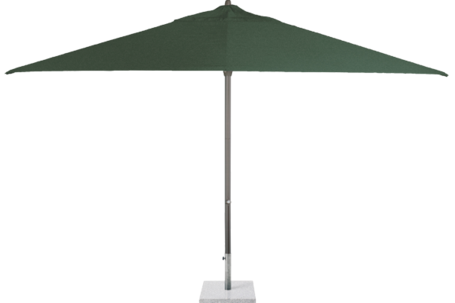 400 x 300cm VIGO ELITE RECTANGLE UMBRELLA. VIGO ELITE features “Easi Track” opening and locking control on the shaft. The umbrella top raises on closing to clear tables and lowers on opening. Fabric is O’bravia Solution dyed canvas – it is a fabric that has legendary fade resistant properties, exceeded only by Sunbrella Acrylic. Medium Concrete, Granite or Steel Bases. OPTIONAL.